The following free online CLV calculator is ideal for quick calculations of customer lifetime value. If you need a more detailed calculation of customer lifetime value, please download our free Excel template for calculating customer lifetime value. You only need to enter three numbers – into the white cells – namely, average new customer acquisition cost, annual per customer profit contribution, and annual customer retention rate. It is based on the simple formula for CLV, as discussed on this website. The customer lifetime value number will be calculated automatically (within a few seconds) – please do not write over the orange cell. Generally, marketers are looking for a positive customer lifetime value – and one that is significantly greater than the new customer acquisition cost. A negative customer lifetime value is a major concern and needs to be rectified through a revised marketing program and/or cost reductions. This simple online CLV calculator does not include a discount rate. 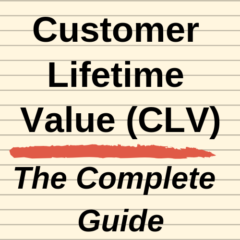 Therefore, there is a danger that with a high customer retention rate that this simple CLV calculator will significantly overstate the true customer lifetime value position. If a discount rate is needed, then please use the full CLV calculator. And if you require customer lifetime value calculation for business purposes or for a major university assignment, it is recommended that you utilize the free Excel template on this site, as well as reading a number of articles to have a better understanding of CLV.